Nestled into the Salt Lake Valley, between the Oquirrh and Wasatch Mountains, you’ll find the city of South Jordan. There’s plenty to do in the area, including lots of gorgeous outdoor places to explore. Whether you’re bring the family for a hike to see the Rocky Mouth Waterfall, or for a day of discovery at Loveland Living Planet Aquarium, you’ll need a reliable car to get you there. You can find one at the Volkswagen dealer near South Jordan, UT, Volkswagen SouthTowne. Whether you’re in the market for a classic Beetle, a compact Golf hatchback, or a capable family sedan like the Alltrack, there’s a Volkswagen on our lot to suit just about any lifestyle. You can also discover our new VW inventory by taking a look at our website, where every make and model is listed for you to explore. You can use our helpful filtering tools to narrow in on the model that’s right for your needs, browsing by price, features, and more. If you have any questions during your search, or if you need assistance and advice, feel free to reach out and speak with a member of our sales team. They can tell you anything you need to know about any of our models, and provide guidance toward the option that’ll be the best suited to your lifestyle. When you find a model or two that you like, let them know, and they can help you to schedule a test drive, so you can get behind the wheel for yourself. 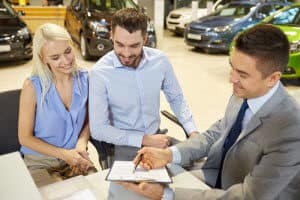 Once you find that perfect car from our South Jordan Volkswagen dealership, you’ll want to find a good payment plan, so you can get behind the wheel and head home as soon as possible. Our finance center is here to assist you in finding a plan that works for your financial situation. For the ultimate convenience, find our financing application on our website, where you can apply for financing electronically. Our team will be able to review your information right away, and get back to you to discuss your options for a loan or lease plan. This makes the whole process even more quick and streamlined, so you can focus on what really matters: Hitting the streets in your new ride! Long after you’ve driven that car home with you, you can always come back and visit our service center to get the maintenance and repairs that your car needs. Our team of expert technicians can provide your car with the proper care that’ll ensure it remains in like-new condition for years on the road, and if you ever experience a problem, they can fix it. You’ll always be able to trust that your car is in the most capable hands. Are you ready to find the perfect car for your trips around South Jordan and beyond? Contact Volkswagen SouthTowne today to schedule a test drive, and we’ll help you find a car you love!